ultimate sacrifice. . . . They say.....Whether our lives and our deaths were for peace and a new hope, or for nothing, we cannot say. It is you that must say this. more were wounded. 250 enemy soldiers perished. 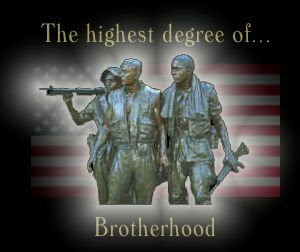 were pinned down battling entrenched Viet Cong. Province, 10 U.S. soldiers lost their lives. . .
the ultimate sacrifice. 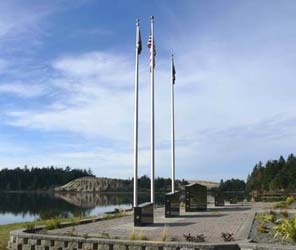 . .
Veterans Memorial at Coos Bay, Oregon. Photos provided by Mike Harris & Larry Webb. Tribute to all Veterans, "Before You Go"
These are the bricks that Larry Webb had installed at the Veterans Memorial shown above - Bravo, Larry Webb! We all can recall the pictures and images of Americans evacuating the U. S. embassy building in Saigon, on April 30th 1975. Immediately thereafter, the communist troops of North Vietnam finally seized Saigon, and at that time many Americans regarded that singular event as the personification of a senseless war; i.e., the Vietnamese won when the U. S. troops suspended all combat operations, and vacated their country. The times they-are-a-changing, though. 20/20 hindsight has provided a rather new view on who ultimately won the war. This is all, now, a perspective that has become much more clear ever since the Berlin Wall came down. It could not be seen back in the 60's, 70's or even 80's, but the end of the Cold War revealed a lot about the Vietnam War. I assert that we, the U. S. veterans of Vietnam, in the end, started a job in Vietnam that ended with America eventually winning the Cold War. But first, some background: I don't consider myself to be highly political; I rarely get embroiled in extreme causes or political views. Oh sure, I have some strong opinions, but none of which could be considered very extreme right or left thinking. However, I do believe in the 'American dream', and am committed to defend our way of life, just like my dad whom served in the Pacific during World War 2. In the 1960's, however, I was young and unsure if there was moral value in our fighting in Vietnam. Note that I said "unsure". To me the "jury was out"... maybe yes, maybe no. But when I was drafted, the rules of my own beliefs were to follow the call, which was part of what was required of us who had been enjoying the best America had to offer. I was ready and willing to do my duty, but I readily admit that some of my earlier doubts returned when good friends started to die in battle. Somewhere along the way, it no longer seemed to be so much about fighting for my country, but rather more of fighting for myself and my brother soldiers. I was somewhere that I did not want to be, but was determined to be a good soldier, and also to return home. This I wanted equally for my soldier friends, and I felt that from them, as well. But later, more doubts about the war surfaced when I finally came back from Vietnam and returned to college. Although, I was honestly surprised when I learned that many of my civilian friends, fellow students and acquaintances thought badly of my participation, i. e., of my "going along" with an allegedly unjust war. It was as though those whom had fled to Canada to avoid the draft were heroes for acting upon stronger convictions [To them, I would say that our platoon medic, "Doc" Gary Maibach, a Conscientious Objector who didn't carry a weapon, but was nevertheless right at our side in combat, was a far better example of a hero]. But still, like many Vietnam combat vets, I was never quite sure of what to think of our efforts after the war ended officially - perhaps even ignominiously - on April 30th, 1975. Remember that most of the Vietnam veterans were among the start of the so-called "Baby Boomer" generation, born just at the end of World War II; we were the children of the "Greatest Generation" that had won the Second World War. But soon, the Soviet Union (a WW2 ally) was actively exporting communism throughout the world, and even directly challenging the American way of life (I still remember, as a child, the fear brought on by the air-raid sirens in my neighborhood, and the "Duck and Cover" drills during school). Because of the ever-increasing nuclear threat as the Cold War intensified, both the Soviets and the Americans became determined to disallow the other from gaining ground (literally); we did not want the Soviets spreading communism throughout the world, and surely they did not want us in Asia due to the threat that democracy posed to communism itself (which is precisely what caused the Korean War, in 1950). As a matter of fact, the Korean War was a direct manifestation of President Truman's containment policy, which was intended to avoid an all-out war with the Soviet Union (World War 3?). This "containment" program was intended to prevent the successive spread of communism, colloquially known as the "domino theory" (i.e., one nation falls to communism, and they in turn cause a neighboring country to fall to communism, et cetera... until all of the 'dominos' eventually fall), and it was this policy that had compelled the U. S. to support democratic South Vietnam against the threat of communist North Vietnam. A North Vietnamese victory could result in the development of communist regimes throughout Southeast Asia, and possibly even into surrounding regions that the U.S. regarded as an important component of its national security. Was this a realistic view in those times? Yes, the Soviets were absolutely committed to the worldwide expansion of communism. With a large army and a nuclear capability, the Soviet Union was a potentially dangerous enemy of the United States. Recall Soviet Premier Khrushchev's candid threat "We will bury you". Recall, also, the Soviets attempt to place nuclear missiles in Cuba, aimed at us. We were correct to not underestimate them. The Soviets, too, were careful not to underestimate the influence of democracy, and were desperate that we not have a foothold in Vietnam. In fact, the Soviets were willing to [and did] spend tremendous amounts of money to prevent that. We, also, spent tremendous amounts of money, but it was the Soviet Union that eventually imploded financially in 1991, not the United States (the perennial flaw of purely communistic systems is that they cannot win 'economic wars' against capitalistic systems). Simply, the Soviet Union ultimately could not afford its massive expenditures in Vietnam. Moreover, the Soviet Union had devoted an inordinate effort and focus to 'win' in Vietnam by providing massive material support to the Hanoi government, and this meant, for the time that the war went on, communism was not being spread elsewhere throughout the world. By the 1980's, when the Reagan administration began to tremendously increase U. S. military spending, the Soviet economy began to exhaust itself... never really recovering from the energy it expended in Vietnam. So, it was we, the soldiers of the Vietnam conflict, who played a very pivotal role that began the winning of the Cold War, and securing the American way of life that we so believed in. We may not have known it then, but we were fighting for ourselves, for our parents, for our grandparents, for future American generations, and yes, for something not so very trivial, our American freedoms. The fighting of the Cold War, which had much of its roots with our efforts in Vietnam, is ultimately why the Cold War ended. Indeed, the Russians have still not recovered to this day, not by a long shot. For example, the [former] Soviet Union can barely even field much of a Navy anymore. Although, their now quasi market economy is just starting to allow them a shot at recovery. Even so, a fair portion of the Soviet Navy still remains idle and rusting away among various neglected shipyards. Yes, more than fifty-eight thousand American military men were killed during the Vietnam War, a tremendous loss. But, according to some scholars, the number of North Vietnamese Army and Viet Cong that died in the conflict approached closer to 2,000,000. Whatever might be said of the war in Southeast Asia, that kind of devastation absolutely assured that Vietnam could not easily export communism throughout Asia (though they did try nonetheless, but with no tangible effect). Despite a communist insurgency in the Philippines, for example, the Philippines never experienced a pro-communist coup or overthrow. Neither did Indonesia, nor India, etc, etc, etc. The spread of Asiatic communism was halted there in Vietnam. So we, the veterans of the Vietnam conflict, and also our families, can take some heart in knowing that there was a noble end to our efforts and sacrifice after all. Today, with really little exception, countries with pure Marxist communistic economies no longer really exist with the notable exception of North Korea and Cuba (there may be hybrids with communistic-type totalitarian regimes, though now with quasi-capitalistic infrastructures). And North Korea is purported to not be able to even properly feed their population, it's that bad for them. Despite the boom and bust cycles that capitalism seems to engender, even with occasional slow growth and recessionary periods, capitalism never sinks that low. I predict that the future world will eventually draw itself towards capitalism, following our example. Perhaps even, the world will start to draw towards worldwide democracy as well. This is what we won by fighting in Vietnam. Today, and in the future, people can now say to us, the veterans of Vietnam, "Thank you for your service." Today, we will walk in the parades� holding our heads up high. The above text was compiled from an e-mail exchange between Gene Harvey and his eldest son Eric. Eric, a history buff, was born in 1969 to Gene and his wife Deana following Gene's return from Vietnam in 1968. As a dramatic reversal of the negative portrayal of the Vietnam War, both during and after the war, Gene accepted his son's view as a timely gift, and shared this gift in a speech to his combat buddies and their families at the Charlie Company, 4/47, 9th Infantry Division reunion in San Antonio, Texas during the Veteran's Day Weekend 2008.